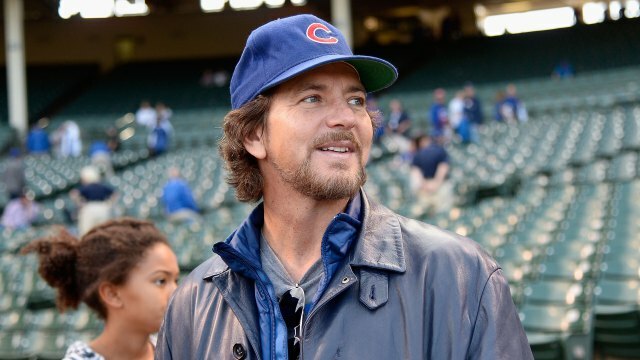 Yeah, so you've probably heard ... Eddie Vedder is a Cubs fan. Tonight the Cubs have started their series against the Mets to *gasp* win the pennant!? You may have even heard that Eddie Vedder has sworn off October touring, but it's a weak threat given that Pearl Jam only tours in October about 2 out of every 4 years. This year, only if the Cubs make it to game 7 of the World Series will Pearl Jam's current schedule get in the way. Still, y'know, he's excited. He wants you to be too. The Ten Club is taking pre-orders for Eddie Vedder/Cubs shirts this week. Act quick! The pre-sale only lasts until October 23rd. Shirts are $30 plus $6 domestic S&H. No guarantees you'll be wearing it to root for the Cubs in the World Series.